May 2018. Membrane proteins are important targets for medical drugs as they control the transit of information, ions and solutes across membranes. Membrane proteins have persistently evaded efficient high throughput analyses due to the lack of suitable techniques as well as major challenges with regard to their fragile properties and low abundance. 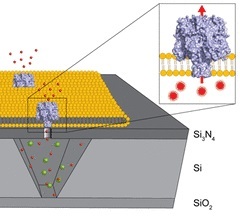 A team of scientists led by Robert Tampé from Goethe University and Marc Tornow from the Technical University of Munich now present a method involving a novel architecture of silicon chips with embedded nanopore microcavities, based on a silicon-on-insulator technology for high-throughput optical readouts. Membrane proteins involved in transport processes are key targets for pharmaceutical research and industry. Despite continuous improvements and new developments in the field of electrical readouts for the analysis of transport kinetics, a well-suited methodology for high-throughput characterization of single transporters with nonionic substrates and slow turnover rates was still lacking. The new method involves transparent nanopore cavity arrays that enable highly parallelized optical studies of single membrane proteins on chip. The scientists constructed arrays containing more than 14 000 inverted-pyramidal cavities of 50 femtoliter volumes and 80 nm circular pore openings via high-resolution electron-beam lithography in combination with reactive ion etching and anisotropic wet etching. These cavities feature both, an optically transparent bottom and top cap. This unprecedented transparent chip design provides parallel and independent fluorescent readout of both cavities and buffer reservoir for unbiased single-transporter recordings. Spreading of large unilamellar vesicles with efficiencies up to 96% created nanopore-supported lipid bilayers, which are stable for more than 1 day. A high lipid mobility in the supported membrane was determined by fluorescent recovery after photobleaching. Flux kinetics of α-hemolysin were characterized at single-pore resolution with a rate constant of 0.96 ± 0.06 × 10–3 s–1. This method represents an ideal chip platform for pharmaceutical research, which features high parallelism and throughput, synergistically combined with single-transporter resolution.